I’ve participated in every Cloth Diaper Carnival; how can I miss this one? Not a chance! Anyone want to know how we travel with our cloth diapers? This is probably our BIGGEST challenge. We have spent a week in New Orleans, a week at Disney, and several short trips…without our cloth diapers. I haven’t figured out a way to make it work on long trips at hotels. Why? 1. We fly A LOT since hubby works for the airlines. We are very limited to what we can carry with us. 2. We tend to stay in hotels where we don’t have access to washing machines. 3. We have a 6 yr old also and don’t like to stop for much on our trips. So when we fly and stay in hotels on our vacations we take disposables with us. It kills me to leave our stash behind but it’s the most practical option for us at this time. We did however take our diapers with us last weekend on our trip to Georgia. Luckily we were only going for 2 days, we were driving, and we were staying with family. That made all of our challenges much easier. I thought my dear hubby was going to object at first but to my surprise HE wanted to take them with us. (*Happy Diaper Dance*) So we packed up our truck with all our million things that babies require and off we went. We didn’t have any problems at all. His mom was wonderful with the diapers; I gave her a brief intro and then we left for the day! (We went to see a college football game – without the kids – GO DAWGS!) Since we were only gone for the weekend we didn’t even do laundry until we came home. I don’t have a large wetbag though…guess I need to go shopping…so we packed up the dirties in a trash bag for the ride home. In the future I may try some other options while traveling. I just received a box of GroBaby BioSoakers (their disposable inserts) to try. Of course hubby wasn’t all that impressed with them out of the box. He didn’t understand why they were any different from disposables. 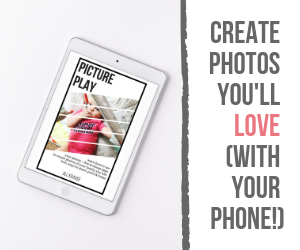 (Don’t worry…I’ll explain it all to him <and you> in a future post!) Another option is one that Kim at Dirty Diaper Laundry tried in Vegas…she signed up with a diaper service while traveling. What a great idea! To make that work I guess I would need to get some covers; I don’t have any of those either…since I don’t use prefolds. What about you? Do you travel with your cloth? I’d love to hear your story! 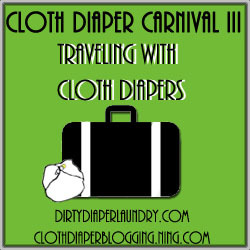 You can also follow the rest of the Cloth Diaper Carnival by visiting Dirty Diaper Laundry. She has a great McKLinky at the bottom of her traveling post. We’ve never flown with cloth either. I am going to use gdiaper on our next two trips. I really wanted the grobaby’s but didn’t want to “shell” out the money for the shells! As far as the diaper service goes, when I had been using a service, not only did they provide the prefolds, but they also provided the covers. So it might just depend on the service you are wanting to use. As for traveling with our cloth stash, we did it for a long weekend trip where we drove and knew we’d have a washer and dryer available. But, on our one flying trip that involved hotels and multiple flights and destinations, we opted not to. The thought of the airline losing our luggage with her diapers was more than I could swallow. well, it won’t work for flying…but when we travel by automobile, I carry a rubbermaid tote and some laundry detergent. With a little water and the agitation provided by the roads and the engine, I end up with a portable washer. I still wash them again when we get home, but at least I feel like-if we have an urgent situation-I have clean diapers and there is no smell.